The 9 December elections concluded a rough year for Romanian politics. Unfortunately, there is no sign of more serene times ahead. 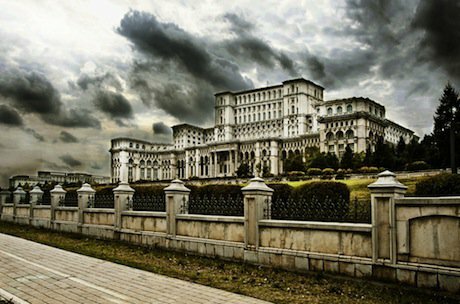 Impending storm on the Romanian parliament? Shutterstock/Crydo. All rights reserved. The 9 December parliamentary elections in Romania, in fact, seemed not to have been as shot through with fraudulent practices as those in July. After the elections took place, there were very few protests about abuses at the polling places. The campaign itself centered around the personal conflict between Socialist Prime Minister Victor Ponta and President Basescu (Liberal Democrat Party), and very little on the issues of austerity, fiscal reform, the role of the Anti-Corruption court, and the relations between the three branches of government. As is often the case in some of the successor states to the Soviet Bloc, politics have returned to a struggle between political clans or alliances gaining control and not about responding to the larger needs of the population. The December elections confirmed the sentiments expressed in the July vote. President Basescu, elected in 2004, lost his popular support in 2010 for reasons ranging from his vulgar and brutal behavior to the austerity policies he agreed to impose after accepting aid from the IMF and EU. Despite bad weather conditions, 41.7 percent of the eligible voters showed up at the polls, a higher number than in the 2008 elections - although there were not enough votes to validate local referenda dealing with very important questions such as shale gas and gold mining. Without doubt, this was the sweeping triumph of the liberal-social alliance. The Social Liberal Union coalition (USL), led by the Social Democrat Prime Minister Victor Ponta and the National Liberal Party Senate leader Crin Antonescu received 60.1 percent of the vote - the largest majority since the triumph of Ion Iliescu's National Salvation Front triumph in 1990. The right and center parties who more or less supported President Basescu (the Democratic Liberal Party, the Civic Force, the Christian-Democratic National Peasants’ Party, among others) tried to re-package themselves into a new alliance known as the Alliance of the Romanian Right (ARD). This initiative was carried out too late and stripped the individual parties of many of their supporters, and left voters to the center and right confused by what the ARD actually is. The new coalition gained only 16.7 percent of the vote. A new party built around media-magnate Dan Diaconescu, the Popular Democratic Party (PP-DD), came in third with 14 percent of the vote - with its nationalist and populist appeals. Also, the PP-DD gave a place for unhappy voters to vent their anger. The UDMR representing the Hungarian minority barely topped the five percent of the vote threshold need to participate in government, and looked to find a useful coalition partner. So, this stormy and turbulent year in Romanian political life ended with the USL - a hybrid of ex-communists and classic liberals - holding most of the political power. To arrive at their dominance there had been three governments, one impeachment of President Basescu (his second in five years) with its attendant referendum which failed, and a legislative vote in December. There was also the condemnation for corruption and imprisonment of former Prime Minister Adrian Nastase (2000-2004 - during the presidency of Ion Iliescu) and the investigation of many of the political clans by the Anti-Corruption Court. In the spring and early summer the USL, sometimes reverting to the language of the Ceausescu era, rode roughshod over fundamental laws and procedures, fired officials they did not agree with and intimidated the courts of justice. All of this was done in the desire to unseat Traian Basescu, avenge the imprisonment of Nastase, and to protect politicians and local leaders who were in the sights of the Corruption court’s prosecutors. Ponta and Antonescu carried out their programs with a brutality and disdain for European Union norms that most non-Socialist European governments protested, and against which the European Union and the United States Government issued strong warnings. Romania will enter 2013 with many of the same problems it faced in January 2012. President Basescu’s mandate will not terminate until the end of 2014. After the USL’s victory he is constitutionally mandated to name somebody from one of the parties in the USL coalition as the next Prime Minister. He has voiced his disgust at naming Ponta - who is burdened with plagiarism charges, accused of lying to the EU, and has offended the older members of his party by his behaviour. The president had very little room to maneuver – had he named another person in an attempt to split the USL, he may well have faced a humiliating rejection. And so, on 17 December, he named Ponta as his Prime Minister. Romania wants to join the Schengen zone - and their chances were harmed by the political battles of the spring and summer. The next discussion with the EU will be in March. Will Basescu and Ponta find a way to get along to convince the Europeans of their credentials to enter Schengen? There are visible fractures in the relationship between Antonescu and Ponta. They joined to get rid of Basescu, but once he is gone, what will bind them? Antonescu was visibly shaken when Ponta began to arrange an alliance with the Hungarians to gain 2/3 of the parliament. This majority would allow him to push through massive constitutional changes in Romania, much as Victor Orban did in Hungary. The financial crises have led to an increasingly anti-western and anti-EU rhetoric in Romania since 2008. This summer, reprimands by high level EU officials, leaders of the American State Department, and non Socialist European leaders led to growing resentment against the west. Moscow can only be pleased to see the problems of a NATO ally and an EU State and look forward to warmer relations, as Crin Antonescu recently remarked that China and Russia will be useful allies in the future. As at the beginning of the year, the Romanian state is virtually non-functional in its capacity to use EU funds - which are generous. Because of the lack of a corps of functional officials and corruption, to the end of this year Romania has made use of only one tenth of the available funds. Peasants wanting EU aid in forming co-ops to sell their cheese, for example, are unable to break through the layers of incompetence and corruption. Answering the Roma question continues to be deferred by Romania, as there frankly seems to be no policy except to export the Roma to France and other European countries. Social services remain a scandal, especially in the field of medical care. The infrastructure remains flawed, with the need for new urban services, bridges, highways, and railroads. And finally, there is the question of the continual functioning of the National Anti-Corruption Court. Will the long list of corrupt officials be investigated and imprisoned, or will the old clans reclaim their immunity? Ponta’s teacher and mentor Nastase will probably leave prison at the end of January. There are very few candidates of presidential stature for 2014. Could Ponta oversee Nastase’s comeback? Ironically, despite all of this, Romania’s economy remains the strongest in the Balkans with an unemployment rate of 6.9 percent (almost five points below the European-wide unemployment rate) and an inflation level of 5 percent . Despite the political disorder, Foreign Direct Investment remains surprisingly solid. There is money to be made there, which the political elites and their associates manage to do. However, the Romanian GDP per capita is second to the lowest in the EU, exceeded only by Bulgaria, and this is the Romanian paradox. There is a political vacuum in which the actual needs of the population are not heeded. Instead, the competing clans and personalities fill the air with hateful, violent declarations—while maintaining their wealth, and their people’s poverty.